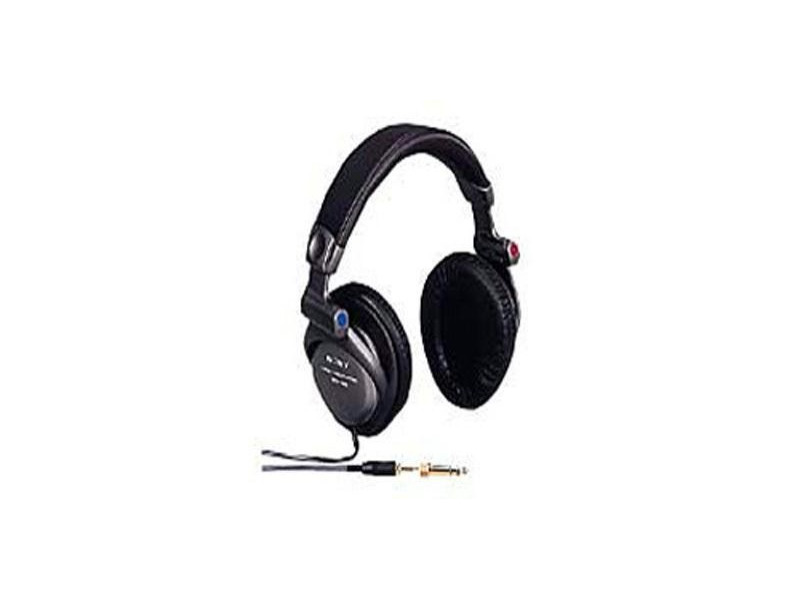 Sony MDR-V6 Headphone has been a industry standard for over 20 years. Still one of the best headphones for Studio Monitoring,Mixing, Djing and for many other applications. There is a reason why this headphone is still being made today, basically it sounds great and is priced very reasonably. I am so upset with this over-priced headphone. I was excited with it for a short while and then I realized that the wire is weak where you plug the headphone into the audio equipment. The music gets cut off on my left ear and I have to juggle the stupid wire around. I went out of my way to get an expensive headphone thinking this problem would not occur but, alas, I am very disappointed. Don't waste your money. They are the best for the money. You could spend more and get alot less. Agree the ear foams could be better, but how can I complain about headphones Ive had for 18 years! These would be a perfect score in my book, but the the ear foams have to have mention, but should not take away from the quality of these head phones. Holy Cow! I cant believe how great these Sony MDR-V6's are. I have had mine since about 1990 and I used them alot when I first got them. I changed interests for awhile and didnt have a need for these headphones anymore and stored them in their little bag and put them in a foot locker and havent used since about 1994.. Flash forward to 2008 my wife always complains about my music when Im on the computer and shes watching television so I thought, Im going to get some headphones and realized I had stored these MDR'V6's since 1994, surely they cant be worth anything being stored that long. Boy was I wrong, I took them out of the bag and slapped them on and couldnt believe just how comfortable these really fit my head! These headphones make you love music again, its unbelievable how great these really are. Listen to the LIVE version of Hotel California with the accoustical beginning and you'll crap at how good these things are. If you love music, you owe it to yourself to get a pair of these headphones, I promise you wont be dissapointed. In a word AWESOME! I signed up just to say something about these headphones. I dont normally like Sony anymore, but they nailed it with these headphones. GET YOU SOME! Sound - Clarity, Accurate bass, and the ear pads cover your whole ear. Also it came with 1 year warranty in Australia. The cable is too long in my opinion. It is coiled, but its still a little bit annoying. I shouldn't complain, this is only a very minor weakness! I bought these based on internet reviews. I was a bit cautious about buying a product without hearing it first, but once I arrived at the store, they had a pair that I could try before I bought it. I can say that they are high quality headphones (both in sound and construction). My previous pair of headphones were Technics RPDJ1200. In comparison, these headphones have a bit more clarity, in terms of overall sound and bass (i.e. the bass in the Technics was nice and loud, but in the Sony its 'clearer'). Perhaps this is because of a higher frequency range. Overall I prefer the Sony pair. If your after a good high quality pair of headphones, I would recommend these. They feel like they are going to last for quite some time, because its well constructed and tough, but not heavy on the head. I would recommend these for DJ'ing, Audio Production, and home use (if you enjoy quality music). I have finally compared the two side by side, and when I am working in Logic, I find that I am able to get a better overview of sound with the V6 than the 7506. Why, because I can hear what's up there beyond 20khz. Although sound when bounced is at a range of 20 to 20, I find mixing, and mastering with the V6's accurate, and clean. Some times you wonder to yourself when listening, are my headphones (V6) bad or is it how it was recorded. Later on you will find out it was how the specific sound was recorded when you hear distortion. Since the range is so large (5hz-30khz) you can hear everything, including the distortion of not well leveled sound (which can sometimes be a peeve for some). But that's whey these were made for the studio, and not really for personal listening. So you can get the levels just right. The Cord is Nice and long, and above all things, it is coiled. They seem to have a massive drive (1 W), and seem hard to blow, unless you do some serious testing. This is one area where these headphones need to improve, I like the fact that they SEAL your head, trapping in sound, nearly noise canceling because of the circum-aural design.But for a greater experience, even if your cushions have not worn out yet (which the MDR's are famous for), I would go ahead and get the Beyerdynamic Velour Padded Earcushions for the Sony MDR7506 and Sony V6 Headphones, DT250, DT280. They will add a greater experience to your sound, and work, and give you comfort as well. They only cost 19.50 from B&H. The Bag it comes with. . . I believe this was probably the best thing I could have done for my ears. . .and my work. It has a wide freq range, quick response, and great smooth lows. i have truly been satisfied. I had to give it 4 stars for the ear cushions, since I can upgrade to the Beyerdynamic Velour Padded Earcushions. Excellent clarity, range and sensitivity, that's what's important. Could be lighter but they keep my head from floating away. Good price too. A little uncomfortable but worth it. I bought mine in the late eighties. Loved em them and love em now. There might be a better pair out there but not at this price. I had to replace the pads last year, so what? Haven't used them. Bought ear pads from a duplicator cheap. I suppose I'll need new speakers someday but I'll just buy another pair instead. Ear pads: replace them with "beedt250v"
No need to repeat all the good things already said. I've used mine for 20+ years, and I keep coming back to them after trying others. Quite a bargain and in production forever. Two things to be aware of: 1. As others have noted, the earpads wear out and are less then good even when new. So, replace them for $20 with good cusions from Beyer. Just google on "beedt250v" to find them. 2. These are great for iPods for 4 reasons: (1) low power needs, so no need for a headphone amp; (2) mini plug is std, so no adpater needed; (3) foldable, so are portable; (4) as good headphone go, these are cheap, so you don't have to worry carrying them around. Unmatched sound quality!! Every thing else pales in comparison. Pads wear out after 8 years of daily use. Can be alittle warm after an hour or two but the best sounding ear muffs I've ever worn. A little bulky, heavy at times. I wish Sony could make MDR V6's micro sized for outdoor use!! First of all, the headphones pictured are NOT the original MDR V6 phones and I am told they are junk. I purchased my MDR V6 phones around 1988 I think. I remember the specs on the package stated a frequency response of 5Hz-30,000kHz! I was completely blown away! For the first time, I heard my favorite albums as they truely sound! I heard things in the music that I never heard before such as the fingers sliding on the strings and deep, tight bass sound that I didn't know existed. Then I got turned on to Telarc Digital CD's and Sheffield Lab Recordings and WOW!! I could not believe my ears. Sound reproduction has come a long way since my scratchy Jimi Hendrix albums. I found a new appreciation for what a great mastered disc sounds like verses a poorly mastered disc. I'm not an audiophile per se, but I know what I like. I've since sampled very expensive, high end headphones that many "purest" audiophiles think are smoother, somewhat richer in tone but I disagree. The smoothness is in the music and quality of the mastering. With these headphones, you hear everything, good and bad. I've used these phones constantly for almost 17 years..... NO LIE, and they sound as good today as they did when I bought them. Yes, the pads wore out after about 8 years but were easily replaced by Sony for about $25. Yes, they can get a little warm after an hour or two but it's worth it! Over all, one of the best products I've ever purchased! Great headphones for novices like myself. Clear crisp sound and very comfortable to wear. Info for Socal. You can order replacement pads direct from Sony. Here is the info on ordering. Description: Pad Assy, Ear Part Number X-2113-124-1 Price $5.95 each plus shipping and tax You can order by calling them at 1-800-488-7669 or from the web at www.sony.com/accessories Delivery was very fast. I got them in less than a week.